I'm excited to show off the most recent installation of my prints. 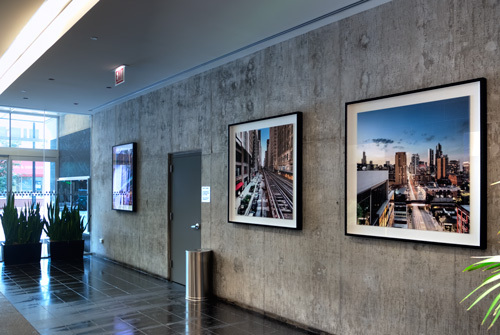 1620 S. Michigan, a 320 unit residential building in Chicago's South Loop purchased three of my large (44" tall) prints for display in their lobby. Each print is archivally bonded to a 100% cotton rag mat, then undercut and platform mounted to a fabric lined museum box, 2.75" deep with 4" border. The effect is such that the prints appear to be floating within the frame. I worked with the board members of 1620, producing a custom proposal to help guide their decision about the best size and style prints for the space. 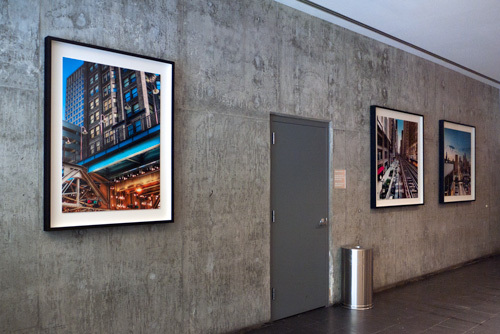 To compliment the tall ceilings and industrial nature of the room, we chose colorful and larger images with dynamic lines.